A good bottle of wine, salad, and bread are all you need to make a terrific dinner with this wonderful Seafood Paella. Paella is the perfect party dish because it is a one-pot meal and because it feeds a crowd. Paella is meant to show off the rice itself and to highlight a few special ingredients. These ingredients can be vegetables, fish, shellfish or meat. Any seafood you desire may be used in the Paella. Delete or add seafood of your choice. The amounts of the ingredients are relative and it does not matter if you use more of one and less of another or chose not to use some at all. The vital thing is the preparation of the rice so that it comes out loose. You will need a somewhat deep cooking dish, large cast-iron skillet, or the traditional Paella Pan (paellera – a round flat pan with two handles). The size of the dish or pan depends on the number of portions you wish to make. Please check out my Spanish Paella Dinner Menu (with recipes) using this delicious Spanish Mixed Paella recipe. Also read all about our Travels in Andalusia, Spain. I adapted this Paella recipe by Chef Brandon Frohne, an award winning 4th generation Chef and Winery Chef at the acclaimed Chateau an Winery and Resort in Braselton, Ga. The word “paella” comes from the Latin word “patella,” meaning pan (in which they cook and by their cooking method). The only indispensable ingredients in making paella are rice, water, and olive oil. Everything else is the subject of endless debates and discussions by Spaniards, who love a lively discussion and consider their own recipe the one and only. Spanish paella is a spectacular dish with a rich history. It originates from a region of Spain called Valencia, which is in Eastern Spain. Today, paella can be found in most seaport cities of Spain. Every Spanish cook claims to make the best paella in the country. The most popular story of paella’s origins is that servants would take the leftovers from Moorish royal banquets and cook them up over open fires into delicious dishes they would take home to their families. It is though that the word “paella” may come from the Arab word “baqiyah”, which means “leftovers”. It is also thought that the word “paella” is derived from a Latin word “patella”, which was a flat plate used for religious offerings made to gods. 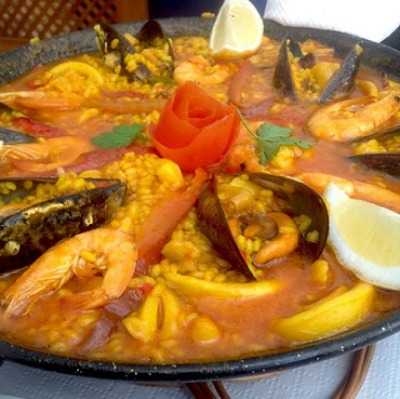 Since seafood was rare in the city of Valencia, they used chicken, rabbit, duck, and snails in their paella. Paella is said to be a perfect union between two cultures from Spain (the Romans for the pan and the Arabs that brought rice). Paella gained popularity in the mid-20th century when paella became a popular dish served to laborers. The workers would gather midday to combine their leftovers with rice and cook over an open fire. It is believed that most paella dishes at the time consisted of snails and whatever vegetables the workers could scrounge up, and meats like chicken or rabbit were only added for special occasions. * If you have some fish or seafood stock, substitute it for part of the chicken stock. ** I do not always add the chicken, because I add a large amount of seafood. *** Paprika is an especially important addition to most paellas. Do make an effort to buy Spanish smoked paprika. **** Since clams and mussels are cooked directly in the rice, they must first be purged of grit by soaking them in water. Scrub the clams and mussels and rinse well. Then place in a bowl of salted water to cover. Sprinkle with about 1 tablespoon cornmeal or bread crumbs and then refrigerate several hours or overnight. Rinse well before using. Have all ingredients chopped and measured before beginning the final cooking of the paella. It is a quick cooking dish that must have all ingredients ready to go. This is called Mise en Place. Preheat oven to 350 degrees F. Place oven rack in the middle of the oven. In a large pan over medium-heat heat, heat the chicken or seafood stock; reduce heat to low and keep broth hot (not boiling). In a large Paella Pan or heavy cast-iron skillet over medium heat, heat the olive oil. You will need a somewhat deep cooking dish, large cast-iron skillet, or the traditional Paella Pan (a round flat pan with two handles). Season the diced chicken breast with a pinch of salt and pepper and sautto a golden brown for approximately 4 to 5 minutes. Leave the chicken in the pan and add the onions, garlic, bell peppers, tomatoes, and fresh thyme. Saute mixture for an additional 2 minutes. Deglaze the pan with the chardonnay wine, scraping up all brown bits on the bottom of the pan. Increase the heat to medium-high heat. Add the rice, hot chicken stock or seafood stock, saffron threads, and smoked paprika to the mixture and bring just to a boil. Reduce mixture by 1/2, stirring occasionally, approximately 15 to 20 minutes. Once the rice is added, stir to coat well with the pan mixture so that the rice absorbs the olive oil and is thus sealed, preventing the rice from releasing its starch and keeping it firm. Season with salt and pepper to taste. Add the lobster meat, prawns, clams, mussels, sausage, salt, and pepper to the mixture. Transfer paella pan to the oven and cook, uncovered, about 15 to 20 minutes until the rice is almost al dente and until almost all liquid is absorbed. Never cook paella until the rice is completely done. If you do, it will be mushy by the time it reaches the table. Remove from the oven when the rice grains are no longer hard but still have more bite than you want and a crust forms around the edge of the pan. Cover with aluminum foil, and let sit 5 to 10 minutes or until the rice is cooked to taste. Paella must rest after being removed from the oven, during which time the final cooking takes place. To serve, sprinkle with chopped parsley and arrange lemon wedges around the top of the paella. To serve traditionally, set the paella in the middle of a round or square table so that everyone can eat it directly from the pan. To eat, sprinkle lemon juice over paella. Always bring the paella to the table in its pan for your guests to admire before serving. Traditionally, paella is eaten communally with everyone sitting around the pan and taking the rice directly from the pan with a spoon. Although you are not likely to serve it this way, do leave the paella pan at the center of the table so your family or guests can help themselves to more. If the paella is almost al dente and ready to be removed from the oven, but still seems to have liquid, return it to the top of the stove over high heat. Without stirring, heat until the liquid has evaporated. Then remove from heat and cover the rice and let it rest before serving. If the paella seems dry before the rice is almost al dente, sprinkle with a few tablespoons of water and allow to cook in the oven 2 to 3 minutes longer. Then remove from oven and cover the rice and let it rest before serving. The History of Paella, The Kitchen Project, by Chef Stephen Block and Chef Stephen Holloway. Introduction to Paella, The History of Paella and Paella Today, by Damian Corrigan. History and Orgins of Paella, The Paella Company. Paella – Spectacular Rice Dishes From Spain, by, Penelope Casas, 1999.